For example, I never order a book without reading the endorsements and some of the reviews. Gail and I never go to a movie without checking out its score on Rotten Tomatoes. We rarely try a new restaurant without a recommendation or two from someone we trust. This has become common-place in almost every area of life. Why? Because with so many options, few of us have time to do the evaluation ourselves. Instead, we rely on the opinions of people we trust. This reduces the risk and helps us make a decision faster. This is why if you are going to succeed as a creative, you can’t afford to ignore endorsements. You must try to get them for every product you create. While the process is sometimes difficult and time-consuming, it is absolutely crucial to getting the visibility and credibility you need. 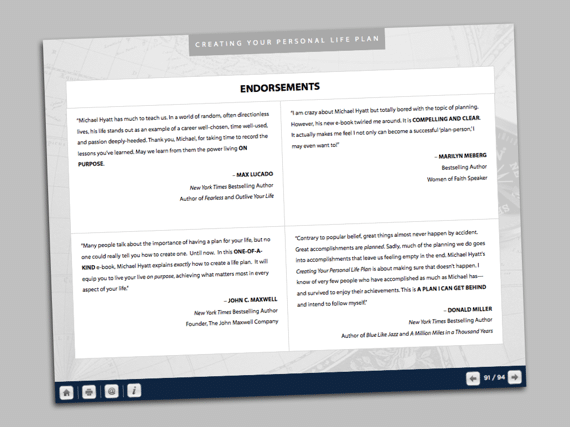 Celebrity Endorsements—These don’t have to be movie or television personalities. They may simply be the well-known experts in a narrow field. For example, if I wanted to buy a new pair of running shoes, and saw an endorsement from Christopher McDougall, that would mean something to me. Why? Because he is a leading authority on barefoot running. User Reviews—These are important, too. I want to know what kind of experience mere mortals have had with the product or service. The celebrity endorser may have all kinds of motives for endorsing a product or service, but individuals are more likely to be candid. By the way, some negative reviews from ordinary users can be helpful. If all the user reviews are positive, I get suspicious. When a few are negative, I assume they are all honest and put greater stock in the positive ones. Make a prospect list. In an ideal world, who would you like as endorsers? Think big. (When I wrote my e-book, Creating Your Personal Life Plan, I started with a list of forty people. I ended up getting twenty-five.) Ask yourself, “Who are the recognized authorities in my field?” Don’t be too quick to rule out someone because you don’t think you have access. You may not know the prospective endorser, but you may know someone who does. Leverage one endorsement for more. It’s always difficult to go first. Sometimes prospective endorsers need an endorsement themselves in order to get comfortable with your product. With my e-book, I looked over the list and said, “Who is the most likely to say, “yes,” because of my relationship with them?” I then asked this person for an endorsement. Sure enough, he gave it to me. I then included his endorsement in all my other requests. (It also gave me the courage to ask the others.) This made it easier for everyone else, because someone else had already gone first. Ask for the endorsement. Don’t beat around the bush. Busy people—like the ones you want endorsements from—don’t have time to read long emails. Get to the point. Also, try to ask them when they most be the most receptive. For example, I always ask for speaking endorsements (and I always ask for them) right after the engagement, while it is fresh on their mind and before they get too distracted with everything else. Provide guidance, samples, and a deadline. Include a brief description of your product and perhaps a sample. Then offer to send them the entire product. Tell them the kind of endorsement you are looking for. The more specific the better. I always tell them that I am just looking for 2–3 sentences. They might write more, but this sounds doable. I then provide a real endorsement or two and a deadline. I ask for it within a week. In my experience you are more likely to get an endorsement with a short deadline rather than a longer one. When you get the endorsement, thank the endorser and then display the endorsements prominently on your product and in your marketing. (Here’s an example.) I have also started distilling the endorsements into soundbites, similar to what studios do with movies. Seth Godin did this on the back of his book, Poke the Box (see an example here). Bottom line: endorsements can make a huge difference in whether or not your product gets noticed by the gate-keepers, trend-setters, and your target market. Take the time to get them. It is worth it. Question: What impact do endorsement have on your willingness to try a product? You can leave a comment by clicking here.